Smooth and voluminous forehead is desired for every single lady. It's not only good facial proportion , but also more impressive and attractive looking . Most of asian people are borned with flat or undulated foreheads but many of them pay attention only nose and chin. Facial harmonisation could not be perfected without smooth and voluminous forehead. Now a day,there are several procedures to enhance forehead area.Each has advantage and disadvantage. Microfat transfer is quite popular one but unpredicatble resorbed fat and uneveness are the the big problems. Usually it need more than one session. Dermal filler is easily to do with less recovery time but the non permanent and unsmoothness of the resting filler including the cost are main disadvantage. 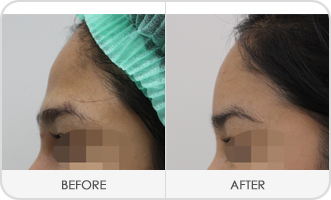 Even forehead Silicone implant are used for many years and it's quite good in term of smoothness and permanent result , there are still some weak points like as major operation, long recovery and sometime visible boundery. At present, 3D customize forehead silicone implant can be made to fit individual forehead contour. It can locate the projection point as well as the required volume. Combination with Endoscopic surgery that can reduce the incision size and recovery time, forehead augmentation with customised silicone implant is the most effcetive procedure now. They can solve many problems of other methods. 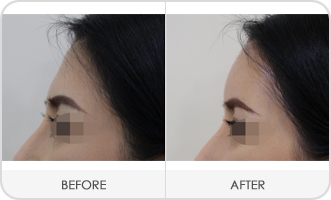 The procedure takes only one hour to do with 3 small incsions in the hair line. The recovery time is about 5-7 days depends on your physical health. Bleeding,hematoma and tempolary paresthesia are possible complications. Previous treatment at forehad area like as filler or fat injection should be informed before this surgery. If customised silicone implant is required , two weeks is necessary prior to surgery. ©2012 Siam Swan Cosmetic Clinic. All Rights Reserved.